In the course of research on All Saints’ Day for a planned piece in the Liturgical Notes series, I have come to believe that the traditional story about the feast’s origin may be either incorrect, or at least very incomplete. I propose therefore to give a summary of the traditional explanation, which seems to be basically the same in a variety of reference works (the Catholic Encyclopedia, Bl. Schuster’s Liber Sacramentorum, the revised Butler’s Lives of the Saints, etc.) and then explain what I think the problem with it is. What I write here is to some degree tentative, and I shall be very glad to see what people may have to add in the combox to clarify or correct matters. The classic account of the feast’s origin is as follows. A commemoration of all the martyrs was instituted in the Eastern churches fairly early on. St Ephraim refers to such an observance on May 13th around the year 360, (Carmen Nisibenum 6) and St John Chrysostom preached a sermon “on all the Saints who suffered martyrdom throughout the world” towards the end of the same century. (PG 50, 705) This latter is routinely described as the first reference to the custom still observed by the Byzantine Rite of keeping the feast of All Saints on the Sunday after Pentecost, even though the sermon begins with the words “The number of seven days has not yet passed since we completed the holy assembly of Pentecost.” Butler’s Lives notes that a feast of all the martyrs was kept on the Friday of Easter Week by the Syrian church, a custom still observed to this day by the Chaldean Catholics and Nestorians. This leads me to wonder whether Chrysostom’s words refer rather to a similar custom on the Friday of Pentecost week, which often imitates the customs of Easter week. The interior of the Pantheon, by Giovanni Paolo Panini (1692-1765) Over the architrave are quotations from Psalm 149, “His praise is in the church of the Saints”, and Psalm 150, “Praise the Lord in His Saints”, words that were formerly sung every single day in the psalmody of Lauds. This inscription has been removed by modern restorations. 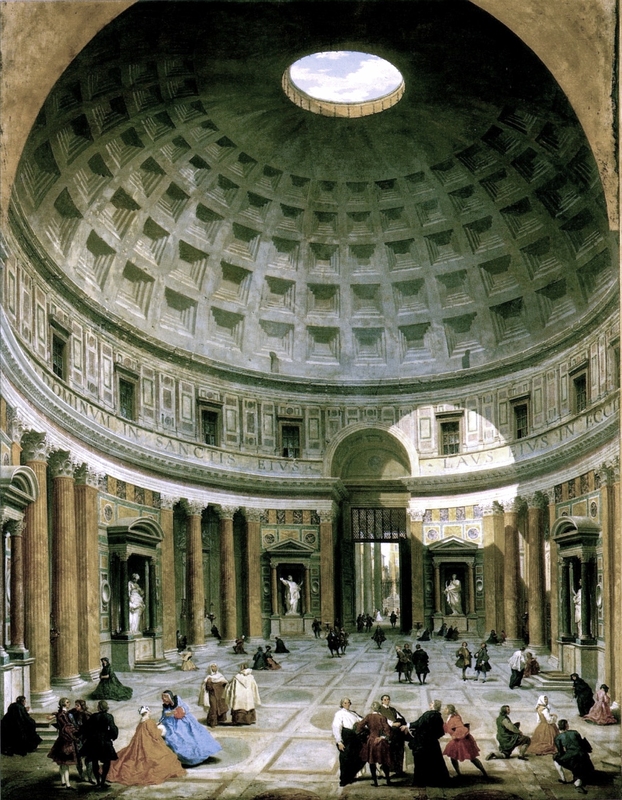 In the year 608, Pope St Boniface IV obtained the Roman building known as the Pantheon, the “temple of all the gods”, from the Emperor Phocas, and dedicated it as a church to the Virgin Mary and All Martyrs, as stated in the Liber Pontificalis. The date of this dedication, May 13th, is the same date as that mentioned by St Ephraim, which seems unlikely to be a coincidence. Since at the time, as it is repeatedly stated, only the martyrs were venerated as Saints, the dedication to all the martyrs is effectively the same as a dedication to all the Saints. Later, however, for reasons unknown, the feast was transferred to November 1st. This is usually said to have been done by Pope Gregory IV (827-44), although the feast was kept on that date before his time in some places. On the other hand, an Irish martyrology of the late eighth century puts it in April. We do not have a decree of Pope Gregory to such effect, but the tradition is recorded in the nearly contemporary Martyrology of Ado, bishop of Vienne, compiled in the 850s; from there it passes into the traditional text of martyrologies, all the way to the Roman Martyrology revised by Card. Baronius after Trent. The liturgical commentators of the later Middle Ages such as William Durandus believed that the feast was instituted to displace the worship of pagan gods in the Pantheon. “Since the individual idols of the Romans could not each have a temple in Rome, they built a temple in honor of Cybele, the mother of the gods, and of all their gods.” After Pope Boniface had obtained it from the Emperor, “casting out the idols, he dedicated it … to the honor of Blessed Mary and all the martyrs, and the feast was called ‘of Blessed Mary at the Martyrs’, for feasts of Confessors were not yet kept, but only of Martyrs.” (Rationale 7, 34) He also notes the transfer of the feast to November 1st by Gregory IV; the same story is told more briefly by Sicard of Cremona. (Mitrale 9, 24) Ironically, this story was also seized upon by some protestant controversialists as evidence of the paganization of Christianity by the Romish church. The problems with this story as I see them are as follows. First, there is very good reason to doubt that the Pantheon was in fact a temple. The word “Pantheon” means “building of all the gods”, not specifically “a temple”. There is no clear understanding of its function, but architecturally, it is completely unlike any Roman temple, and it has no altar. Furthermore, there is no evidence that the Romans had a collective worship of all the gods together. (See Amanda Claridge’s Oxford Archeological Guide to Rome.) The idea that it was a temple seems to have originated in the early Middle Ages, when the Christians could hardly imagine that such an imposing structure could be anything other than a temple. The “Wise Order of the Doctors”, from the vaulting of the Chapel of Saint Brice in Orvieto Cathedral, by Luca Signorelli, 1499. In the West, St Gaudentius, bishop of Brescia in northern Italy from 387 to 410, preached a sermon on the dedication of a church for which he had obtained relics of the Forty Martyrs of Sebaste from the nieces of St Basil the Great; in it, he twice refers to Basil as a “blessed confessor.” The oldest lectionary of the Roman Rite, the Comes of Wurzburg (ca. 650 AD), contains feasts of Pope Silvester I (314-335), of his very brief-lived successor, Pope Mark (January to October 336), and Martin of Tours. St Mark also built a church near the Capitoline Hill in Rome, which is named for him, and is the station church of the Monday of the third week of Lent. It is reasonable to imagine that the seed planted by some of the early hagiographies, such as St Athanasius’ Life of St Anthony or St Jerome’s Life of St Hilarion, flourished earlier than the 7th century, the era of the Pantheon’s dedication. Given that there was a distinction between martyrs and confessors, and that some of the latter were honored as Saints before the 7th century, the Pantheon as a church is always called “ad martyres” in early Roman liturgical sources, not “ad sanctos” or “ad martyres et confessores.” This strongly suggests to me that it was not originally thought of as a church dedicated to all the Saints. 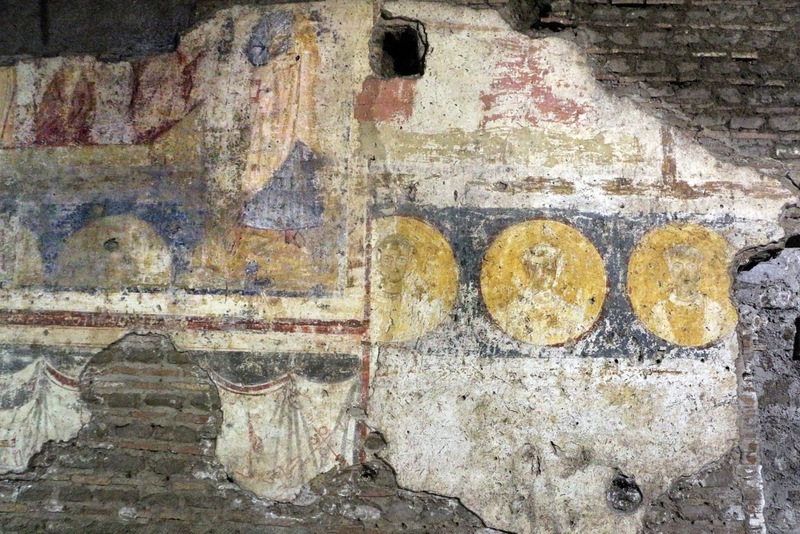 Its first appearance on a list of Roman station churches, also in the Wurzburg lectionary, may perhaps better explain its earliest liturgical use. The stations from Holy Saturday to Easter Friday are arranged in descending hierarchical order, starting, of course, at the cathedral, which is dedicated to the Lord Himself. 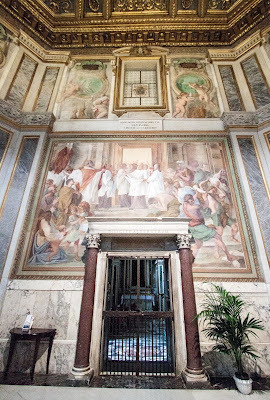 On Easter Sunday, the station is at the oldest church in the world dedicated to the Virgin, St Mary Major, followed on the next three days by the principal churches of Rome’s patron Saints, St Peter at the Vatican, St Paul on the Ostian Way, and St Lawrence outside-the-Walls. The station of Thursday is “ad Apostolos”, the church of the Twelve Apostles, and that of Friday “ad martyres”, the Pantheon. We may note here in passing that Rome therefore keeps the Friday of Easter week “ad martyres”, the same day on which the Syrian churches have their commemoration of all the martyrs; this may also not be just a coincidence. The last station of the Easter octave is also at the cathedral, which is more commonly known as St John in the Lateran. “John” is actually both the Baptist and the Evangelist, who share the church with Christ in a triple dedication. In the early station lists, it is usually just called “the Lateran”, but there is a broad consensus that this triple dedication is fairly early. By the year 468, the Lateran baptistery also had chapels dedicated to both Saints John. This would perhaps explain in part why the station of Holy Saturday is repeated only a week later. The term “confessor” originally meant someone who had suffered for the faith without being killed, and the very first such confessor is St John the Evangelist. According to a tradition already known to Tertullian at the end of the second century, in Rome he was thrown into a pot of boiling oil, but miraculously preserved. 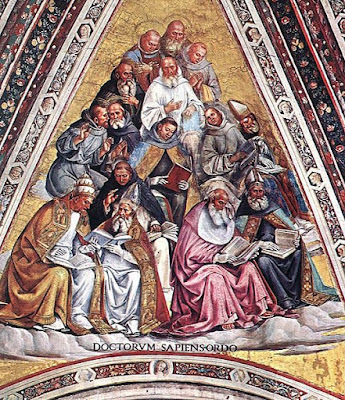 The station at the church also dedicated to him would then complete the hierarchy of the Saints by having him represent the order of confessors. The entrance to the chapel of St John the Evangelist in the Lateran Baptistery. On the architrave is written “Bishop Hilary, the servant of Christ, to his deliverer, John the Evangelist.” Pope St Hilary (461-68) was, as a priest of Rome, one of St Leo the Great’s legates to the false Council of Ephesus in 449, deemed “the Robber Synod” not only because of the heresy which it embraced, but because of the violence with which the Patriarch Dioscurus of Alexandria treated his opponents, which directly caused the death of St Flavian, the Patriarch of Constantinople. This chapel and another facing it on the opposite side of the baptistery, dedicated to St John the Baptist, were built by Hilary as a gesture of thanks for his safe escape from the council. If the Pantheon was dedicated and used liturgically as a church specifically of the martyrs, and not of all the Saints, then we may wish to look somewhere other than its dedication for the origin of the feast of All Saints. I suspect that the real origin lies in the church of Rome’s response to the iconoclast heresy in the eighth and ninth centuries. When iconoclasm broke out in the year 726, the Popes were swift to condemn it. St Gregory II (715-31), in a famous letter to the inventor of the heresy, the emperor Leo III, wrote, “It grieves us that the savages and barbarians are becoming tame, while you, the civilized, are becoming barbarous.” The “savages” are the peoples of northern Europe, then being converted to Christianity by St Boniface, whom Gregory himself had sent to Germany. His successor, St Gregory III (731-41), was a Syrian, elected Pope by acclamation during Gregory II’s funeral procession. In the first year of his reign, he held a synod in Rome, at which it was determined that all those should be excommunicated who “take down, destroy, profane or blaspheme against the veneration of the sacred images of Our Lord, and His Mother, the glorious and immaculate ever Virgin Mary, of the blessed Apostles, and all the Saints,” as recorded in the Liber Pontificalis. It is also stated that he constructed an oratory in St Peter’s dedicated to all the Saints, filling it with relics, and decreeing that in the Masses celebrated in that oratory (and there alone), the words “whose solemnity is celebrated today in the sight of Thy majesty, o Lord, our God, throughout the world” should be added to the Canon. In the book “Images, Iconoclasm, and the Carolingians”, Thomas F.X. Noble (Univ. Penn. Press, 2009) points out that this custom was established by a synod held on Palm Sunday of 732, the decrees of which were cut into a marble inscription and hung on the walls of the oratory; “in a case almost unique in early medieval Rome, the records of a church council were inscribed and hung in public.” (p. 125) The Liber Pontificalis goes on to describe several other artistic projects of Pope Gregory, which Noble describes (p. 126) as “an image-decorating campaign” and “a calculated affront to the emperor’s policies”, with elaborate and high-quality images of Christ and the Saints set up in several important Roman basilicas. Although iconoclasm was officially condemned by the Second Ecumenical Council of Nicea in 787, it was revived from 814-842 under the Emperors Leo V, Michael II and Theophilus. This second period coincides with the reign of Pope Gregory IV (827-44), who, as mentioned above, is said by a near contemporary source to have universally established All Saints’ Day on November 1st. The churchmen and scholars of Carolingian and post-Carolingian Gaul also took a keen interest in the iconoclasm controversy, and the matter was discussed at more than one Gallican synod of the era. In 794, a synod at Frankfurt, working off a very bad translation of the acts of Second Nicea, condemned that council, and what it mistakenly believed to be its teaching on the use of images. Their mistake was then refuted by Pope Adrian I. In 824, the Emperors Michael and Theophilus sent a letter to Charlemagne’s son and successor Louis the Pious, justifying their opposition to the holy images. In response, a synod was held in Paris in the year 825, which to a large degree repeated the mistakes of Frankfurt. At this point, however, we have no record of the papal response or the immediate aftermath of the synod. Gregory IV was then elected in mid-to-late October of 827. St Gregory III’s Roman synod of 731 was convoked on November 1st, as was the Parisian synod of 825. (Mansi vol. 12, col. 299; vol. 14, col. 421) If this is a mere coincidence, it is certainly a very remarkable one. Might it not be that those places which originally celebrated All Saints on November 1st did so in memory of what Pope St Gregory III had done on that day, upholding the true teaching on sacred images, and by extension, on the proper place of the Saints in the Church’s worship? And might it not also be that Gregory IV established that same day as a universal feast, partly in reply to the Parisian synod, and partly to assert that Rome continued to uphold the true teachings on sacred images?